I separated from my now ex-husband in late July of 2011, after a mere ten months of marriage. In those ten months, “Mark” and I had torn down my old rambler in Falls Church in September of 2010 and had a new one built in its place. The process of building the new house exposed major cracks in the foundation of our relationship. The structure “we” built—a 6,000-square-foot box that I later dubbed the “Yuppie Prison”—didn’t have a whole lot of me in it. By the time it was finished, not only did I dislike the house but I disliked what it stood for: for our inability to make joint decisions, to compromise, to resolve conflict in other than win/loss terms. Mark and I never occupied the new house, but that didn’t bother me because it never felt like home to me, anyway. The fact that I had no home to go back to, however, did trouble me. My sister, her husband, and their two kids solved that problem in short order by opening up their house and hearts to me. While at age 40 I might not have chosen to move into a basement with eight and nine-year-old “roommates,” within days of getting there I knew I was in a better place, in every possible way. 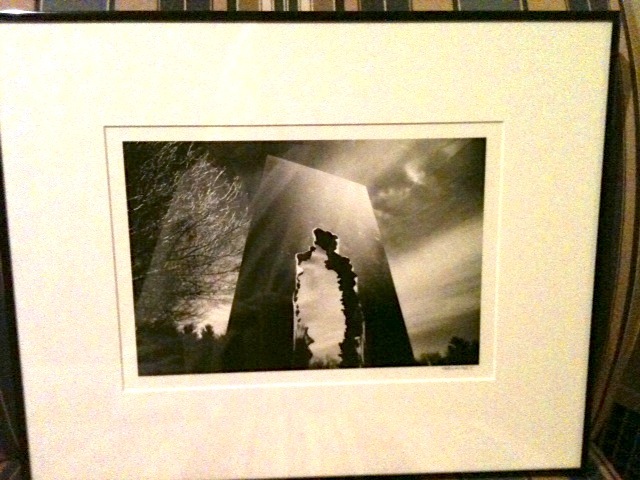 A couple weeks after that, a good friend invited me to meet her at a photography show at a gallery in Bethesda. The artist, a friend of hers, photographs sculpture. I wouldn’t describe myself as an art connoisseur—I’ve spent very little time truly studying it—but I do admire and appreciate it. I approach it much in the same way I do wine, which I also enjoy but haven’t studied much: I know what I like when I encounter it, and I consume what I like without apology. I accepted my friend’s invitation and arrived a while before she did, which gave me a chance to stroll through the show on my own. I liked most of the images I saw, but this one stopped me in my tracks. I liked the composition of the shot, the lighting, and the way the perspective of the photo changes the way the viewer experiences the sculpture. Realizing that I was looking at a person-sized hole in a huge hunk of metal sent me into a fit of laughter. This piece of art within a piece of art captured exactly how I felt about the dark, unpleasant process I had just started, along with my certainty that I would bust my way through it and back out into the sun. And that, however improbably, I would laugh along the way. I kept that piece in my mind’s eye for the next nine months of unpleasantness. It soothed me, amused me, and inspired me. And it still does, because it now graces the wall of the house I bought in April. We all have our reminders of what we’ve gone through, whether it’s a souvenir, a scar, or, in my case, a piece of art. Posted on February 11, 2013, in Uncategorized and tagged healing, Karen Yankosky, relationships, splat-ospheric, the power of art. Bookmark the permalink. 1 Comment. That’s truly beautiful.I have no other words!